Hyper-V Replica is a new feature in Server 2012 that allows for the asynchronous replication of VMs (a fancy way of stating that you are replicating a VM from one host machine to another), which is great for times when you are having issues with a host. Keep in mind that this isn’t migrating, because you aren’t moving a VM from one Hyper-V server to another. Instead, you are making an exact copy of a VM and placing it on another server. As with live migration, the Hyper-V machines do not have to have shared storage or be in a cluster. They just have to be able to communicate on a network. 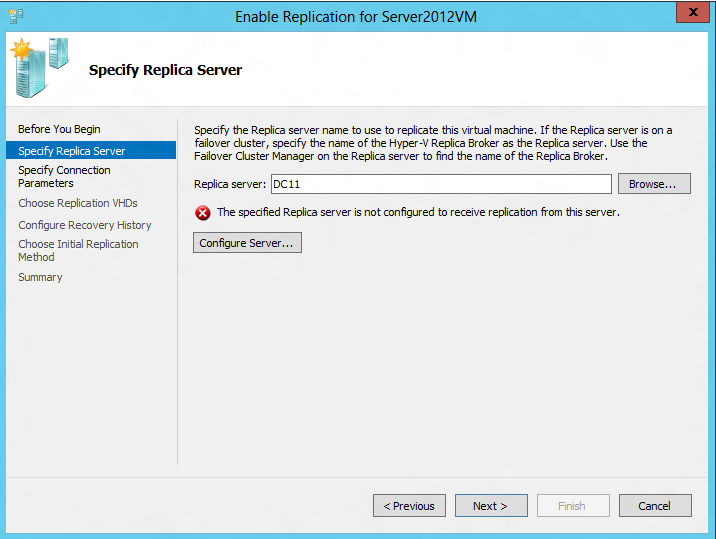 First, to create a VM replica, you have to enable replication. 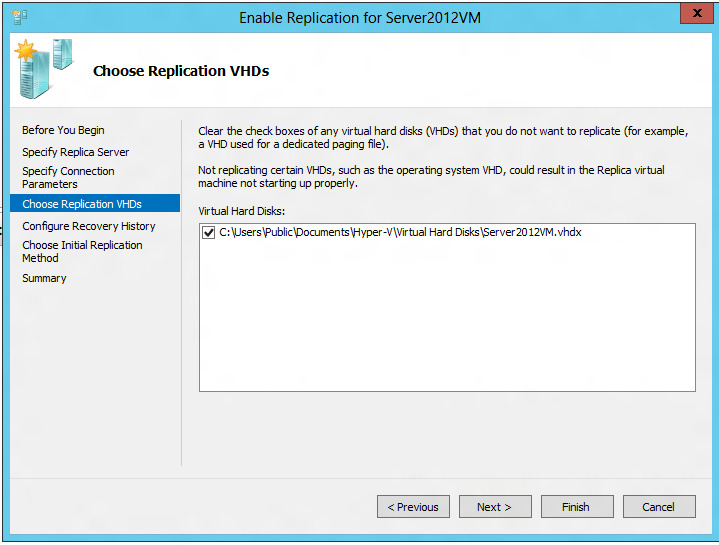 From Hyper-V Server Manager, right-click the VM that’s to be replicated and select Enable Replication. This opens up yet another wizard. The next order of business is to specify the replica server. In Figure 4, I have selected the server that will receive the replicated VM; however, I get an error that the specified replica server is not configured to receive replication. Hyper-V gives us the option to configure the replica server, which we can do remotely, from the host machine that has the VM to be replicated. Once the error message appears, a Configure Server button is displayed. In the Enable Replication window that opens, select the checkbox next to “Enable this computer as a Replica server.” Next, select the authentication method for replication traffic. Kerberos will replicate without encryption, but you can opt to use HTTPS so that the data sent from one host to another is encrypted. Finally, choose the servers that are allowed to replicate within the domain. Save time and configure the servers you know will be used for replication after you set up Hyper-V by going into the Hyper-V settings of that server. Now that the destination server is configured for replication, click Next to display the Specify Connection Parameters window. Here, you confirm whether to use HTTP or HTTPS for the replication traffic, and you can opt to compress the data transmitted (this is enabled by default). Click Next. The next screen (Figure 5) gives you the option to deselect any virtual disks you do not want replicated. The wizard then lets you configure recovery history. Configuring recovery means choosing which recovery point of the VM being replicated you wish to store. The default option is to store only the latest recovery point (which saves on disk space), but you can also store additional recovery snapshots. The final configuration option before the actual replication is to set how the VM should be replicated. By default, the replicated VM is sent from host A to host B over the network. However, in cases where bandwidth is limited, a replicated VM can be exported to external media and then sent over the network at a later time. A third option exists if you have already restored the same VM on the replica server. That restored machine can be used for initial replication. This option conserves replication time and bandwidth, because only the changes made to the replicated VM since the VM was restored to the destination replica server are sent over the network. Set replication to start immediately or schedule the process, and click Finish. Make sure the firewall on the replica server is configured to accept inbound replication traffic. If it isn’t, you’ll get an “Unable to replicate” error. For Windows Firewall and Kerberos and certificate-based (HTTPS) authenticated replication traffic, enable the “Hyper-V Replica HTTP Listener (TCP-In)” rule in Inbound Rules in the Windows Firewall settings. Upon successfully configuring replication, you will see the status “Sending Initial Replication” within Hyper-V Manager (see Figure 6; click Merge. Once you’ve done that, the VM will be in the Hyper-V Manager of the replica server.